Pigs, hogs, swine: all of these are names for wild or tame members of the scientific family Suidae. They are hoofed mammals with 4 toes on each foot. Humans have been raising pigs for more than 9,000 years. Domestic pigs are descended mainly from Eurasian wild boars. Pigs are omnivores, eating plants and animals. Their snouts are well suited to rooting for food scraps, roots, nuts, and insects. 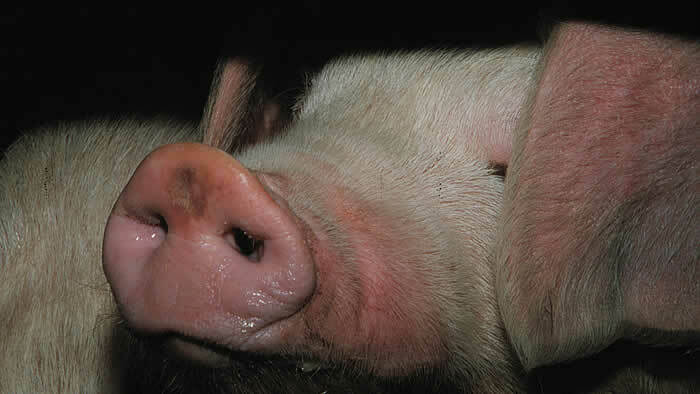 Domestic pigs on farms eat feed rich in protein, vitamins, and minerals. All pigs like water, drinking up to 8-10 gallons daily. Domestic pigs live on every continent on Earth except Antarctica. Pigs do best in environments where they have ample shade, dirt, mud, and water. Pigs spend a great deal of time digging with their snouts, turning over soil to find roots, insects, and garbage to eat. Along with rooting for food, pigs wallow in mud. This helps them cool down and avoid sunburn. 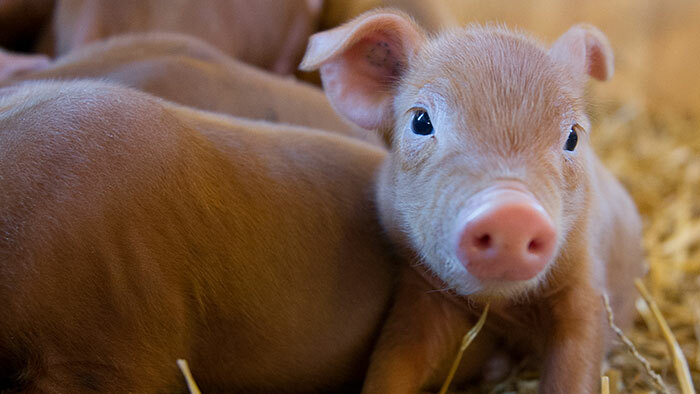 Several hundred different breeds of pig exist around the world today. Because they are valued for meat and other products, domestic pigs are thriving. However, some wild relatives, including the Visayan Warty Pig, are endangered. Number of piglets per litter: 8-12 avg. A herd of domestic pigs lives at the Minnesota Zoo’s Swine Barn. When the farm is open, visitors to the Swine Barn can watch sows nursing litters of newborn piglets and look for older weaned piglets enjoying their feed. The Zoo’s herd consists of crossbred pigs—a mix of more than one breed. Domestic pigs are smaller than the Eurasian boar, a wild ancestor on exhibit at the Northern Trail. They are larger than some other wild relatives, including the endangered Visayan Warty Pig, at the Tropics Trail. Domestic pigs at the Minnesota Zoo live in the Swine Barn. One half of the barn building houses a farrowing crate. This is a warm and safe place for a sow to care for piglets. On the other side of the building, shoats, or recently weaned piglets, eat and rapidly gain weight. Runways leading from the Swine Barn allow pigs to go outside to exercise. At the Swine Barn, Zoo staff and volunteers often hold piglets, giving visitors a chance to pet them. Zoo staff care for piglets from birth, making sure that they are safely housed in a farrowing crate. This modern device protects newborns from being crushed accidentally by their mother when she gets up to eat and drink. Heat lamps may be used on either side of the farrowing crate to keep piglets warm in cold weather. Sows care for their piglets for 3-5 weeks, nursing them frequently. 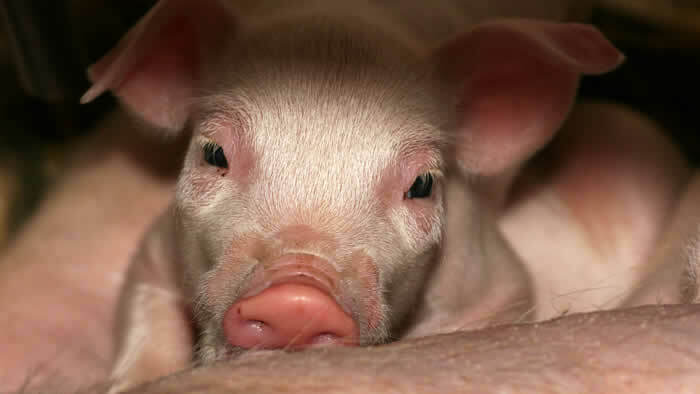 Although a piglet may only weigh 2.5 pounds at birth, it will generally double its weight by the time it is 1 week old. After baby pigs stop nursing, these shoats are transferred to the other side of the Swine Barn. There, they continue to feed and gain weight. All domestic pigs have curling tails. Their wild relatives (including Eurasian boars and Visayan Warty Pigs) have straight ones. During its 6,000-year history, China is believed to have produced more than 500 breeds of domestic pig. Nowadays, Chinese farmers raise about 50 breeds. Pig’s Eye is the original name of St. Paul, the capital of Minnesota, located north of the Minnesota Zoo. Other pig-related city and town names in America include: Bacon, GA; Barrow, AK; and Frankfurt, IL. Pigs are easily house trained and will not soil their own bedding when offered a choice.